Ex Astris Scientia - Observations in TNG: "Silicon Avatar"
Observations in TNG: "Silicon Avatar"
Here are some observations about sets, props and visual effects in TNG: "Silicon Avatar" without a specific theme, and a comparison of the original TV release (TNG) with the remastered Silicon Avatar (TNG-R). The large scanner the scientist on the right is using to scan the ground in this shot was previously seen in "The Survivors" and "Qpid". "Qpid" A better look at the prop in HD. The large transparent display to the left of Carmen Davila most likely displays a map of the proposed colony on Melona IV. We can see the map better in HD. Containers/sheds similar to the one seen in the background behind Riker were seen on Valo II in the previous episode "Ensign Ro". For "Silicon Avatar" the containers were repainted and turned upside down. "Ensign Ro" HD close-up of the containers. The large brown container seen in the background looks strangely two-dimensional. A number of special large PADDs was created for this episode. Dr. Crusher and Carmen Danila can both be seen holding this type of PADD in the episode. 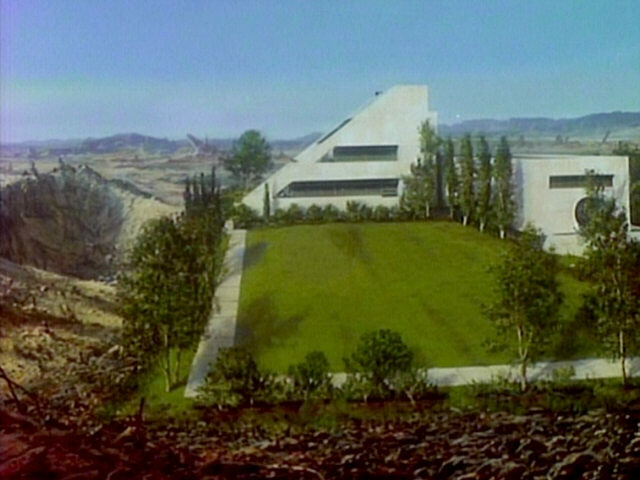 The front side of the PADDs is not actually seen in the episode, but one of these PADDs later turns up in "The Inner Light". Lo and behold: The graphic seen on this PADD matches the map of the Melona IV colony seen on the large transparent display a little earlier in the episode. These PADDs were modified years later and were used as Krenim PADDs in the Voyager episode "Year of Hell". "Year of Hell" The PADDs in HD. The Crystalline Entity blocking out the sun of Melona IV. A new model of the lifeform, different from the one seen in "Datalore", was created for this episode. 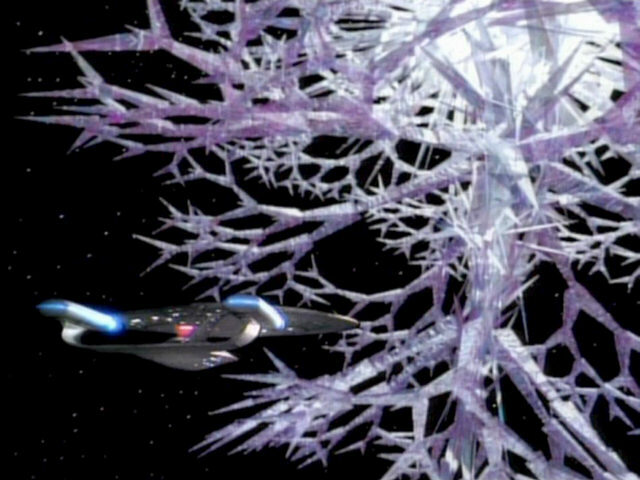 The new Crystalline Entity model in HD. The Crystalline Entity hovers over Melona IV while the settlers are fleeing. Some of the settlers wear costumes previously worn by other characters in the series. The old man who falls down, for example, wears Kevin Uxbridge's costume from "The Survivors". The female colonist in the second screenshot wears Salia's costume from "The Dauphin" and the little boy wears Alexander Rozhenko's costume from "Reunion". Phasers are used to fire at a rock wall and thus to heat up and light the cave. The reconstructed phaser beams in TNG-R. The new dedication plaque, installed at the beginning of season 5, is first seen in this episode. 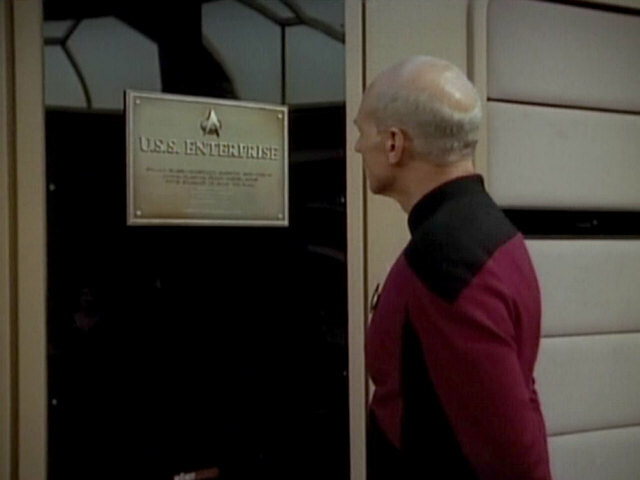 A screenshot from "The Ensigns of Command" shows what the old plaque, used from seasons 1-4, looked like. of Command" The new dedication plaque in HD. The male colonist seen in this screenshot wears Q's civilian outfit from "Déjà Q". 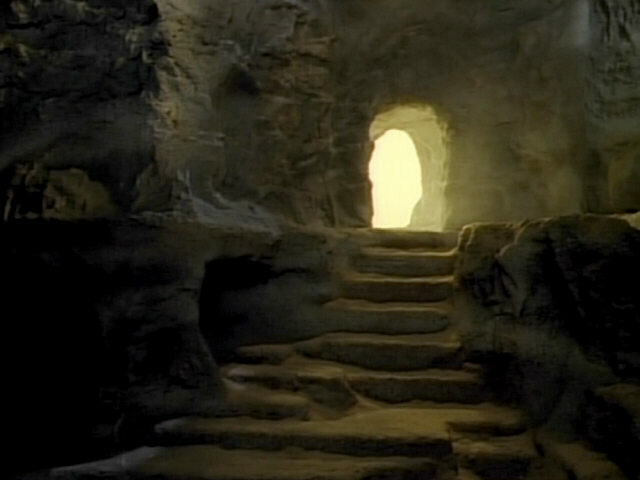 The same cave entrance and stone-hewn steps appear in "Final Mission". "Final Mission" A look at the set in HD. 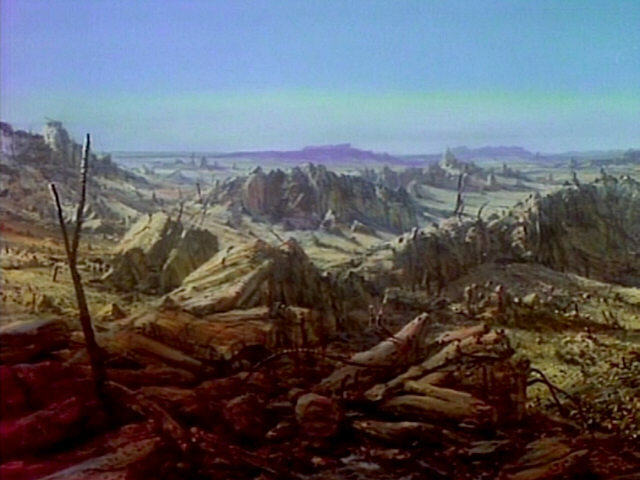 The ravaged surface of Melona IV is depicted using the same matte painting already seen in "The Survivors", in that episode used for Delta Rana IV. Melona IV has previously appeared as several other barren planets. It was seen as Delta Rana IV in "The Survivors" and Turkana IV in "Legacy", for example. 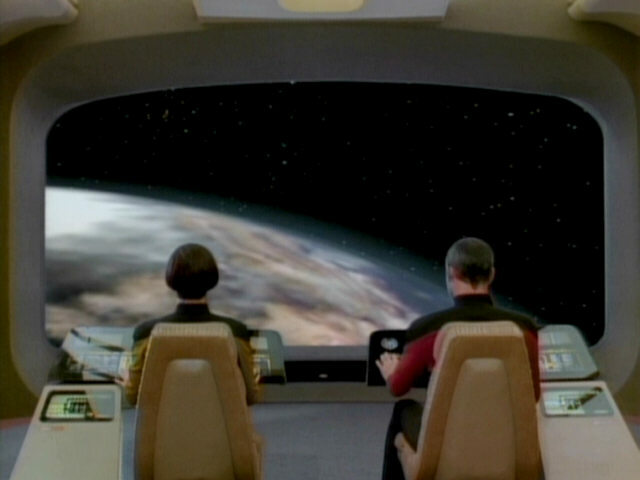 Re-Used Planets in TNG A new planet model can be seen in TNG-R. The shot from the season 4 episode "Remember Me" shows that the wall covering above the side entrance to the transporter room has also been changed between seasons. The material covering the walls in "Star Trek VI: The Undiscovered Country" was still different. The text file briefly seen here on the observation lounge monitor is a re-use of the engineering logs from "Galaxy's Child". Human" When the episode was remastered, it was forgotten to insert a text file into the monitor. 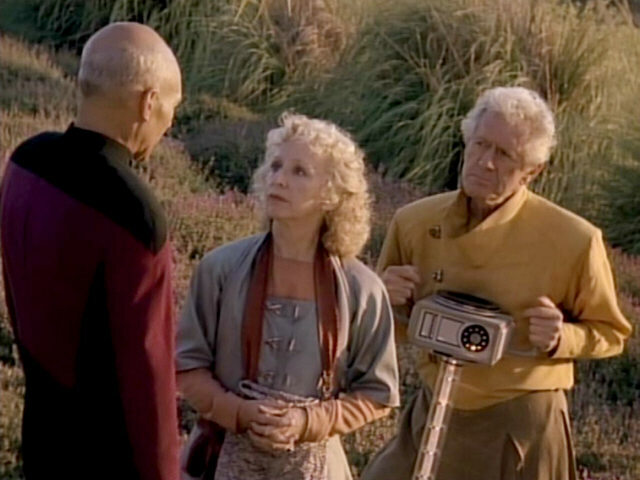 As Picard gets up, the black velcro that his communicator is attached to when he only wears the gray undershirt is briefly visible. The same can be seen in TNG-R. Filming equipment briefly pops into view on the right side of the screen in two shots in this scene. It can still be noticed in HD, but only if we look really closely. The USS Enterprise-D in orbit of Melona IV. Another look at the new planet. Kila Marr examines various files on a small main engineering monitor. The graphics on the left are a re-use of Dr. Timicin's files seen in "Half a Life". "Half a Life" For the remastering of the episode, a new graphic was created. The turbolift is not fully lit when Dr. Marr and Data enter it. To the right of the turbolift door, an unlit LCARS display can be seen. Due to the lighting in the scene, the words "Access Denied" can be read. This is still the same LCARS display seen lit in "11001001". "Redemption I" In TNG-R, we can hardly make out the outlines of "Access Denied". It is visible only after gamma correction. A gamma radiation scan analysis is displayed on this bridge monitor. Dr. Kila Marr's PADD can be seen in the foreground. The graphic in HD. The wall covering of Data's quarters has slightly changed since it was seen in "Darmok". In that episode, the walls to the right of Data's desk were smooth, now they are featuring a ribbed surface. "Darmok" Data's quarters in HD. 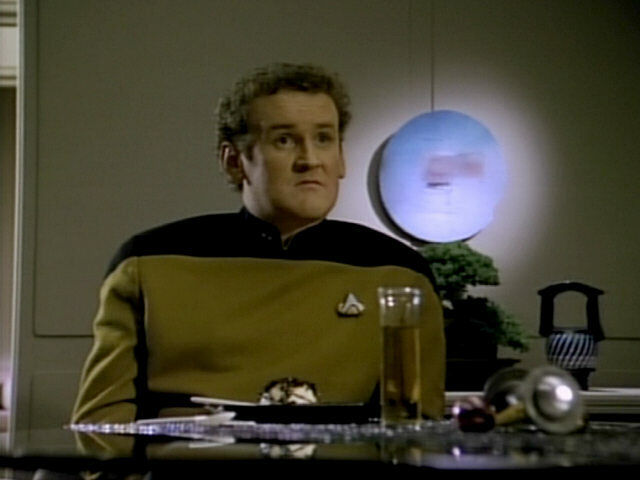 Data's Quarters features several new pieces of set decoration, which would be part of his set from now on, for the first time in this episode. 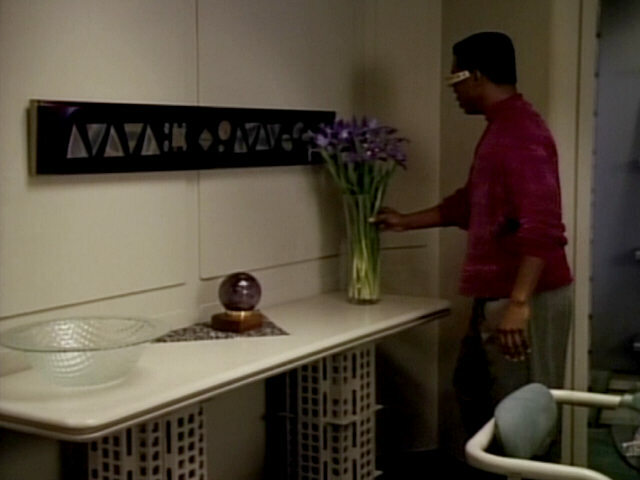 The rectangular piece of wall decoration seen to the left of Dr. Marr in the first shot was originally seen in Geordi's quarters in "Galaxy's Child". The striped jar was originally part of Kivas Fajo's collection in "The Most Toys", it also appeared in the O'Brien's quarters in "The Wounded", though. The shelf behind Kila Marr is new as well. It features a phrenology bust and a rapier. 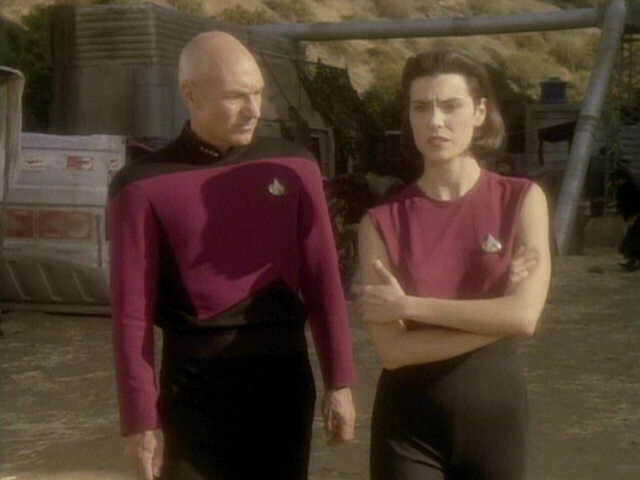 Both would be part of Data's quarters until the end of the series. Only a small portion of a new painting in Data's quarters is seen behind Dr. Marr in the last screenshot. This is a copy of Vermeer's "A Woman Holding a Balance". The painting will be seen better in later episodes. 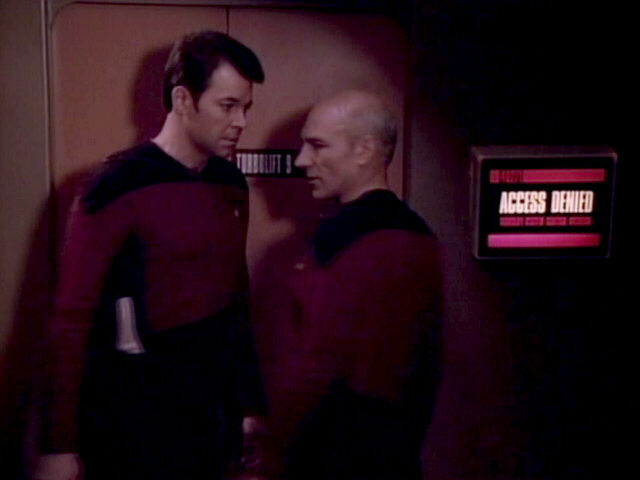 The turbolift door doesn't fully close at first when Data and Dr. Marr enter the bridge in this scene. The door is still open in TNG-R. This shot of the USS Enterprise-D and the Kallisko was lifted straight from "The Most Toys" where the alien ship is the Zibalian freighter Jovis. In this episode, the camera moves much close to the USS Enterprise-D, however. The sequence in HD. 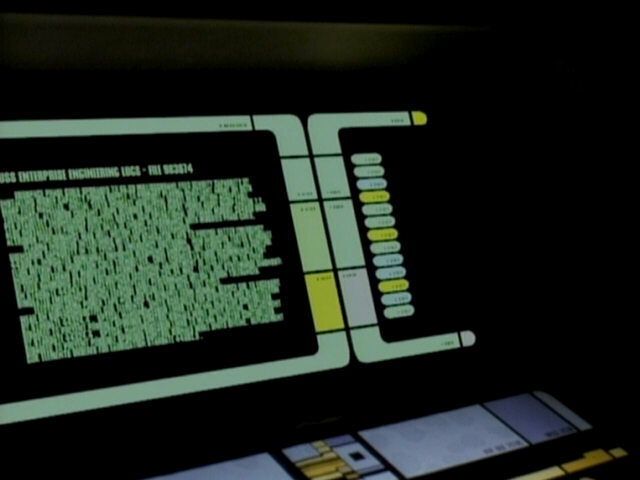 A large text file is displayed on the bridge engineering station, a rare occurrence for this console which normally only displays schematics of the USS Enterprise-D and its warp drive. HD close-ups of the displays. 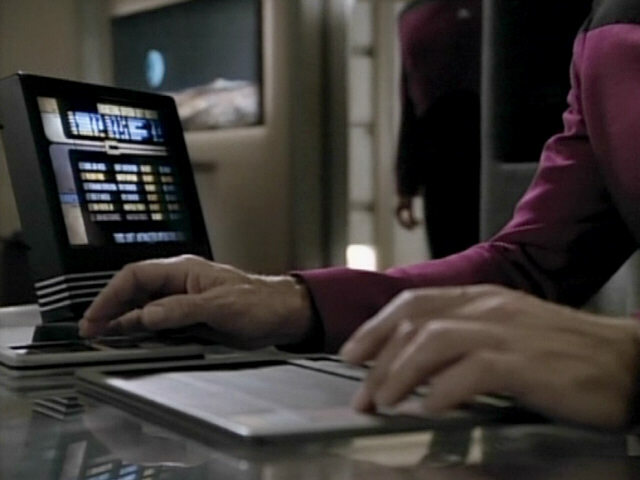 The graphic displayed on Picard's desktop monitor is the engineering division duty roster, also seen in season 4 episodes "Suddenly Human" and "Legacy". The colors of the different lines of text have changed but the text itself is still the same. 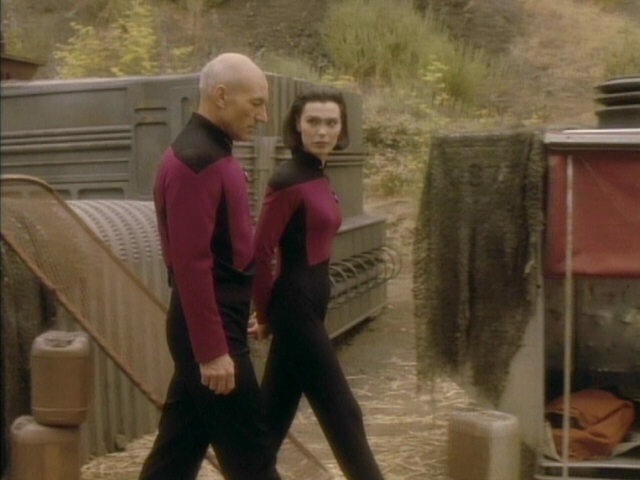 Also notice Picard's interesting high-heeled Starfleet shoes. Another look at Data's slightly redecorated quarters. As mentioned before, the wall is no longer smooth but ribbed now. 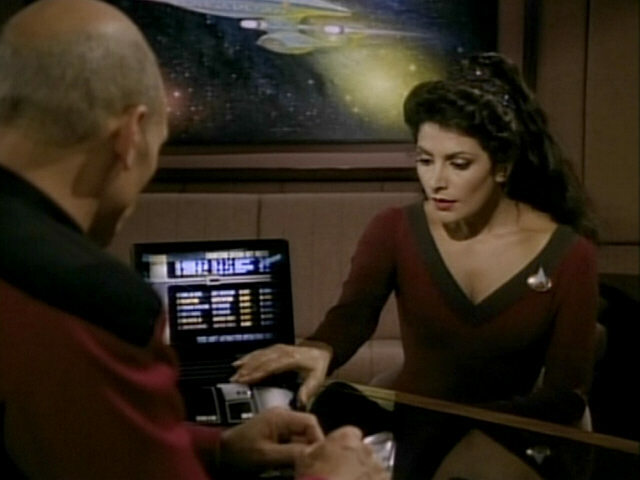 The metallic wall sculpture, still seen behind Troi in the screenshot from "Darmok" and part of Data's quarters since season 2, has disappeared. 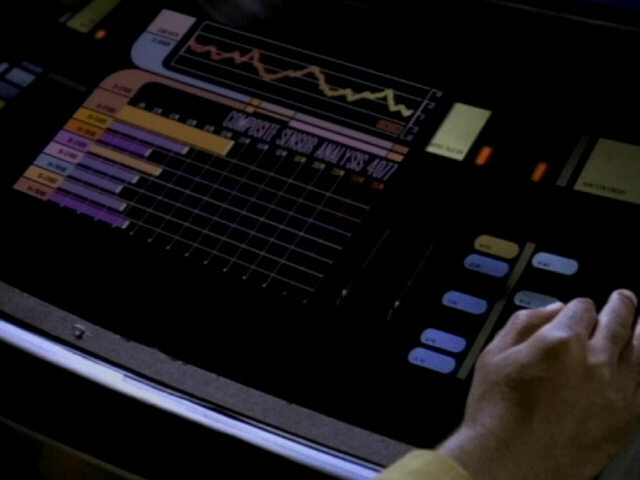 In season 4, the large display built into Data's desk usually displayed a graphic of the USS Enterprise-D, as can be seen in the screenshot from "Clues". "Clues" A look at the display in HD. Another piece of wall decoration that was originally part of Geordi's quarters in "Galaxy's Child" appears here. "Galaxy's Child" A look at the painting in HD. A shot of the Enterprise-D.
Enterprise Flybys in TNG and TNG-R In TNG-R, we see a similar shot with the 4-foot model, as the original footage was missing. Actually, it is a shot of the Enterprise flying into the opposite direction that was mirror-inverted. This shot of the front section of the bridge is stock footage originally filmed for "First Contact". It shows Ensign Bennett at the con, even though he doesn't appear anywhere else in the episode. "First Contact" Another look at the new Crystalline Entity. 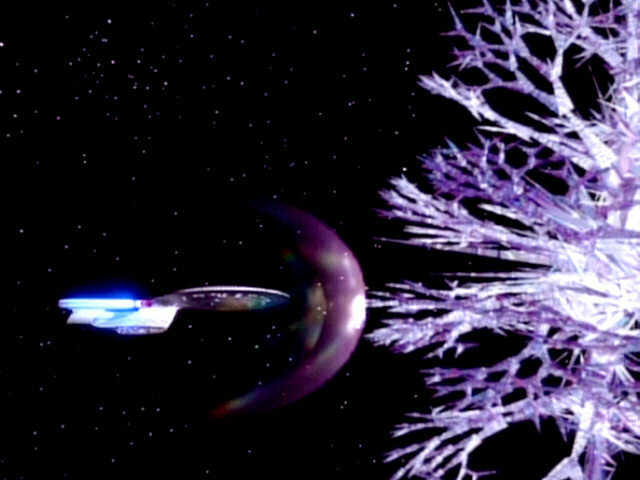 The Crystalline Entity slowly approaches the USS Enterprise-D. This is stock footage of the original version of the Entity created for "Datalore". The Crytalline Entity is seen on the main viewscreen of the USS Enterprise-D. This is the same model of the lifeform seen earlier in the episode. It is different from the one seen in "Datalore" and the previous shot on the main viewscreen. In "Datalore", the lifeform was much more angular and symmetric, in this episode, it appears almost spiral-shaped. The Crystalline Entity shatters into thousands of pieces. 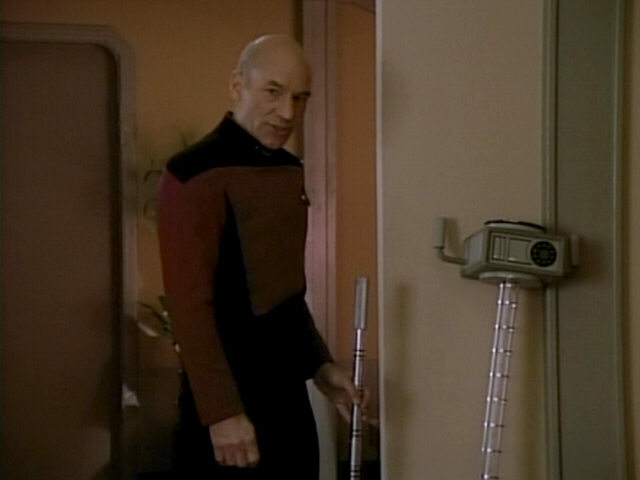 The redone effect in TNG-R.